© Copyright Grant Foster & Pearl Music 2008. All Rights Reserved. Web Design by Austpac. "Not all works chosen for this CD have an historical connection to the palace, but they do project a mood that I imagine was present at the time: a sense of longing; a journey of discovery; a desire to be someone else; grandness; love; sadness and ultimately, untimely loss. When listening to the music I am sometimes reminded of a particular person or persons: their spirit possibly wandering through the corridors of the Winter Palace today. Indeed, phrases from Chopin may still echo from room to room. The "Revolutionary Etude" once performed in the palace’s concert hall with no intention of pre-empting history, takes on an uncanny, almost ironic feel. Rachmaninoff’s music has the soul of Russia in every bar. I’m sure he would have been a favourite with Nicholas and Alexandra. Ravel's beautiful and haunting "Pavane for a Dead Princess" is appropriate, as is my "Elegy". I can’t help but think of the great love between Nicholas and Alexandra when I perform my "Romance in E" and the innocent infatuation between Marie and a young officer with my "Romance in G". 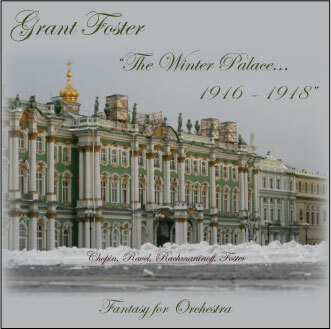 The sense of longing, a stirring and revolutionary passion is hinted at with "The Storm" and the piano arrangement of my Orchestral Fantasy "The Winter Palace 1916-1918" the first movement from "The Pearl of Dubai Suite" attempts to capture the moods of mystery, distance, intrigue, romance, occasion, revolution and tragedy that permeated the palace walls between 1916-1918." PayPal available now! Make payments with PayPal - it's fast, free & secure. 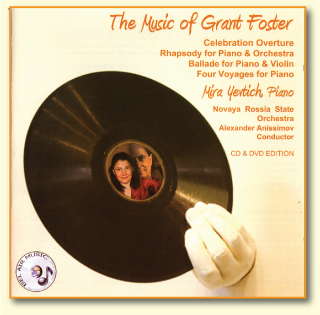 "THE MUSIC OF GRANT FOSTER"
Available through Bel Air Music. Click to contact. or from classical music outlets world-wide.